Planning a drive down the Oregon Coast? Add an overnight stay, or longer, in Cannon Beach. Cannon Beach is most known for the Haystack Rock, a picturesque rock formation jutting high into the sky along the beach. Although the beach is what draws most tourists to this small town, there’s more to do and see than hanging out on the beach! Find out how to spend 24 hours in Cannon Beach, Oregon. My husband and I spent a week in Oregon in the mid-April, 2018. We were extremely lucky with fantastic weather, with the exception of our first night in Cannon Beach. The clouds and chilly weather were welcome to these South Texans, however. Our plans included a weekend road trip down the Oregon Coast, with our first stop in Cannon Beach. Since we had to leave in the morning, here is everything we were able to see in 24 hours! Beach Access Points: W Grove Ave and Ecola Ct. is the main entrance to the beach. Head towards the Wayfarer Restaurant and you’ll find it. If you’re staying on the southern end of Cannon Beach, you can find stairs leading down to the beach off of S Hemlock St., between Forest Lawn Rd and Viewpoint Terrace. The stairs are directly in front of the Haystack Rock. Check high tide schedule to determine the best time to visit the beach. During our stay, high tide began an hour before sunset, but the waves were already past Haystack Rock by 4 PM. Bring appropriate footwear. If you aren’t visiting during the summer months, you’ll want to wear shoes that can keep your toes warm but that can also get wet. Watch out for dead jelly fish in April. They were everywhere! The seagulls enjoyed it way more than I did. Visit Cannon Beach’s website: http://www.cannonbeach.org/ Find out what events are occurring during your stay. For example, the sand castle competition is in early June. Unfortunately for us, the weather did not cooperate for our short stay in Cannon Beach. Clouds add a nice element to photos, especially at sunset, but it was too over cast. It was also 50 degrees and windy (the only cold day we experienced in Oregon). So sadly, we did not stay for sunset, but instead went into town for dinner. Spend some of your stay walking around the quaint town, shopping and eating as you go! There are several shops selling artwork, apparel, and specialty items. Some shops include a candy store, a pet supplies store, and rare Books. If you’re travelling with a dog, your furry friend will fit right in! We saw several pups walking through the town and playing on the beach. A popular spot was the Sleepy Monk Coffee Shop. For delicious pub-fare beyond pretzels paired with good beer, stop in at Pelican Brewing for lunch or dinner. Open later than most restaurants, this tavern offers local brews and pub food. It’s a cool spot to hang out with friends and drink. Another option for late night drinks is across the street at Driftwood Lounge & Restaurant. Great spot for a filling breakfast. I love diner style breakfasts when traveling. A lot of good food at a decent price is exactly what you need before a day of exploring, or driving down the coast. There may be a wait, but it went by quickly and the staff was very friendly. Best part is this restaurant served breakfast until 3 PM. So if you like sleeping in, this is a great option. There are several cafes and bakeries in town, but we chose to get our coffee-to-go from Sleepy Monk. It was close to our hotel and looked like a local hangout. Parking is limited at all of these locations. It’s best to walk to whichever restaurant you choose. For those outdoorsy types, a trip to Ecola State Park is a must. The park stretches over 9 miles of coastline, the park offers hiking, scenic views, picnicking, and more outdoor activities. The beauty of this park begins with the drive in through lush forest of Sitka spruce trees. After paying at the entrance, the road winds left down to a parking lot at Ecola Point. There are two main scenic viewpoints from this area: one overlooking Cannon Beach and another of Tillamook Lighthouse. Crescent Beach Trail is a short, but difficult, hike from the parking lot down to Crescent Beach. Though it is only 1.5 miles one-way, the trail can be steep and muddy, especially in spring. Some of the trail is manicured with steps, but occasionally steps will be on side of a slope and not the other. Once you reach the beach, turn left to find a waterfall. When you’re standing at Ecola Point, looking at the beach, you can see a tall waterfall. Unfortunately, when you’re on the beach the top half of the waterfall is blocked by foliage. You’re likely going to have to walk through water streaming from the falls to the ocean, so hopefully you wear shoes that can get wet! Trail to Indian Beach from Ecola Point is 1.5 miles one-way. If you want to walk in the footsteps of the Lewis & Clark Expedition, drive (or hike) to Indian Beach and hike the 6 mile-long Tillamook Head trail. To cross a portion of the Oregon Coast Trail, follow the 3 mile Clatsop Trail from Indian Beach. Bring appropriate footwear for the trails. Keep a plastic bag and towel in you car for your muddy shoes. Always carry water with you when you are hiking, especially in the warmer months. Plan ahead. Make sure you have enough time to complete whichever trail you choose. A short drive outside of Cannon Beach are two Scenic Overlooks. If you miss the first, you can park at the second and walk, carefully, along the highway to the first one. I tried entering the address and name of the overlook into our rental car’s navigation system, but it wouldn’t pull up, so I had to rely on Google Maps. When looking North, from the first overlook, there are 7 points of interest. You’ll recognize (1) Haystack Rock and (2) Cannon Beach. Beyond that are (3) Ecola Creek, (4) Chapman Point, (5) Ecola Point (which you can visit at Ecola State Park), and on a clear day (6) the Tillamook Lighthouse, and (7) Tillamook Head. When looking South from the second overlook you can see 5 points of interest (there are signs with information at the site, too). (1) Silver Point Rock, (2) Silver Point, (3) Jockey (4) Cap Rock, (5) Castle Rock, and (6) Falcon Point. Cap Rock is pictured below, along with the southern view of the shoreline. 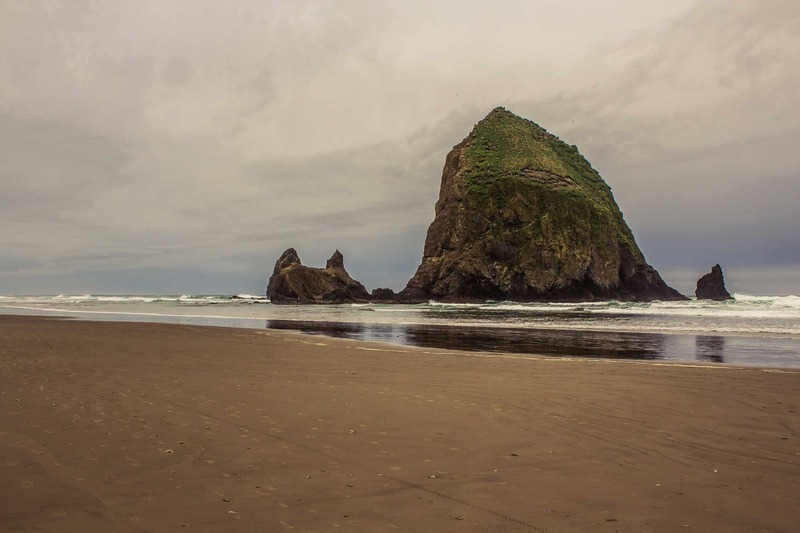 What are your favorite things to do in Cannon Beach? Share in the comments!